The SCALIBOR® Protectorband is an easy to use collar that provides long-lasting protection for your dog against sand-flies, mosquitoes and ticks. What is the Scalibor Protectorband and who is it for? 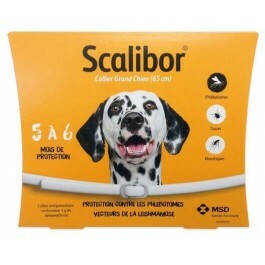 SCALIBOR® Protectorband is a collar formulated from technologically advanced, odourless, plastic matrix that releases the highly effective insect and tick-killing deltamethrin. The active ingredient is released via the friction of the collar on the dog's skin, and spreads over the surface of the dog's body in the oily layer of its skin. SCALIBOR® Protectorband provides protection from ticks, sandflies, and mosquitoes for up to six months and can be used in dogs from 12 weeks of age. It is especially important if travelling with your dog to areas where sandfly-transmitted Leishmaniasis or heartworm spread by mosquitoes is prevalent, but within the UK ticks are often a problem and can transmit Lyme disease and Babesiosis. What is the active ingredient in the Scalibor Protectorband? The active ingredient in SCALIBOR® is deltamethrin. When insects and acarines are exposed to deltamethrin through contact, it causes hyperactivity followed by paralysis, tremor and death of the parasite. Deltamethrin is continuously released from the collar into the coat and the fatty film covering the skin. The active substance spreads from the site of direct contact over the entire skin surface through the lipids and in the hair. Deltamehrin is not absorbed systemically by the host. anti-feeding effect on adult mosquitoes of the species Culex pipiens pipiens for 6 months. 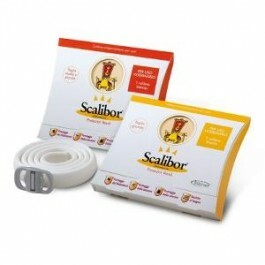 Tin containing one Scalibor Protectorband 4% w/w 65 cm collar. What is in the Scalibor Protectorband? How do I use the Scalibor Protectorband? The 65cm long collar is to be used on large sized dogs. For fastening around the neck. As the collar exerts its full effect after one week, the collar should be preferably applied 1 week before animals are likely to become exposed to infestation. In rare cases attachment of ticks can occur while wearing the collar. Under unfavourable conditions the transmission of infectious diseases through ticks or sandflies can therefore not be ruled out entirely. Remove the collar from the sealed protective sachet. Adjust the collar around the animal’s neck without tightening it too tight. Two fingers side-by side should fit between the band and the dog’s neck. Slide the end through the buckle and cut off any excess length extending beyond 5 cm. Do not use in puppies less than 7 weeks of age. Do not use on dogs with skin lesions. Do not use in animals known to be hypersensitive to pyrethroids. Do not use with other ectoparasiticides containing organophosphates. In case of skin lesions remove the collar until symptoms have resolved. The influence of shampooing on the duration of efficacy has not been investigated. Scalibor Protectorband should not enter water courses as this may be dangerous for fish and other aquatic organisms. This product can be used during pregnancy and lactation. Wash hands with soap and cold water after fitting the collar. People with known hypersensitivity to the ingredients of the collar should avoid contact with the collar. Avoid letting children, in particular those under 2 years old, touch the collar, play with it or put it into their mouth. Care should be taken not to allow young children to have prolonged intensive contact, e.g. sleeping with a pet wearing a collar. Keep the sachet with the collar in the outer carton until use. While occasional contact with water does not reduce the effectiveness of the collar, it should always be removed before swimming and bathing the dog because the active substance is harmful to fish and other aquatic organisms. Dogs must be prevented from swimming in water for the first five days of wearing the collar. In rare cases, local skin reactions (pruritus, erythema, hair loss) involving the neck or the skin in general have been observed which might indicate a local or general hypersensitivity reaction. Altered behaviour (e.g. lethargy or hyperactivity) often associated with skin irritation has been reported in very rare cases, too. In very rare occasions, gastrointestinal symptoms such as vomiting, diarrhoea and hypersalivation have been observed. In very rare cases, neuromuscular problems such as ataxia and muscle tremor have been observed. The symptoms usually subside within 48 hours after removal of the collar. If any of these symptoms occur, the collar should be removed. Treatment should be symptomatic as no specific antidote is known. Adverse reactions should be reported to your veterinary surgeon. In the unlikely event of the dog eating the collar the following symptoms may occur: Uncoordinated movements, tremor, drooling of saliva, vomiting, rigidity of the hindquarters. Contact your veterinary surgeon for advice. These symptoms usually subside within 48 hours. Is there any further advice I should know about the Scalibor Protectorband? For further advice on ticks, sandflies and mosquitoes and the diseases that these parasites can carry,click here.